This article describes a novel method for processing continuous intracranial pressure (ICP) signals with lifting wavelet transformation and discrimination rules for ICP waveform morphology. 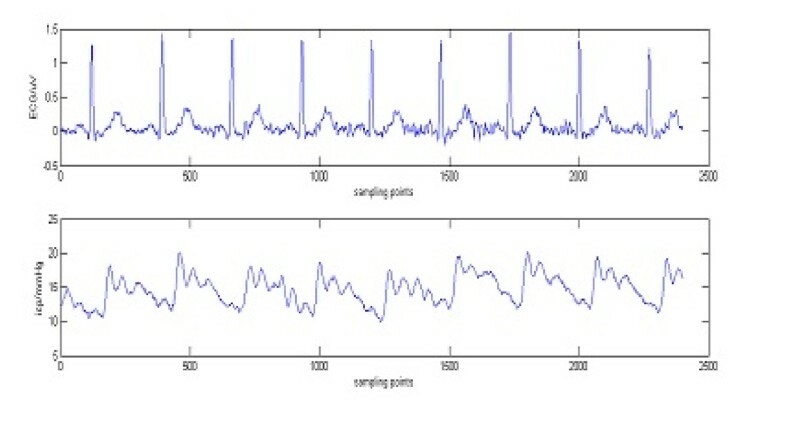 First, lifting wavelet was applied to detect the extreme points of ICP waveform preliminarily; then, the extreme points that were undetected or falsely detected are determined by using the discrimination rules repeatedly; finally, those falsely detected and undetected points were removed or corrected to improve the accuracy of identified individual pulse. The algorithm was employed to analyze continuous ICP signals of nine patients. Signals were recorded for 30 min each. Each signal was divided into 30-s segments and analyzed. The accuracy rate of 98.58% was obtained. The method described in this article has given a possibility for the clinical use of ICP waveform. By identifying the single ICP wave effectively, not only mean ICP but also single ICP wave amplitude and latency can be computed precisely with this new method. Mean intracranial pressure (ICP) is often regarded as a clinical indicator during continuous ICP monitoring, and is computed according to the sum of pressure levels divided by number of samples. However, the ICP wave parameters of a single ICP wave, such as ICP wave amplitude and latency, can provide the information that is not given in mean ICP [1–3]. Many studies have indicated that the ICP wave parameters are related to intracranial pressure-volume compensatory reserve capacity. Hu et al. also pointed out that ICP elevation could be predicted by the prescient change of ICP waveform morphology. The present research situation of single ICP wave identification and its importance in clinical practice has been discussed in other articles very well, and there are several methods developed to analyze the continuous ICP signals [1–7]. We have developed an alternative single wave identification method that combined lifting wavelet transform with waveform discrimination rules. In the premise of not reducing the accuracy of single wave identification, the method decreased the single wave parameters that required identification, and simplified the identification process. 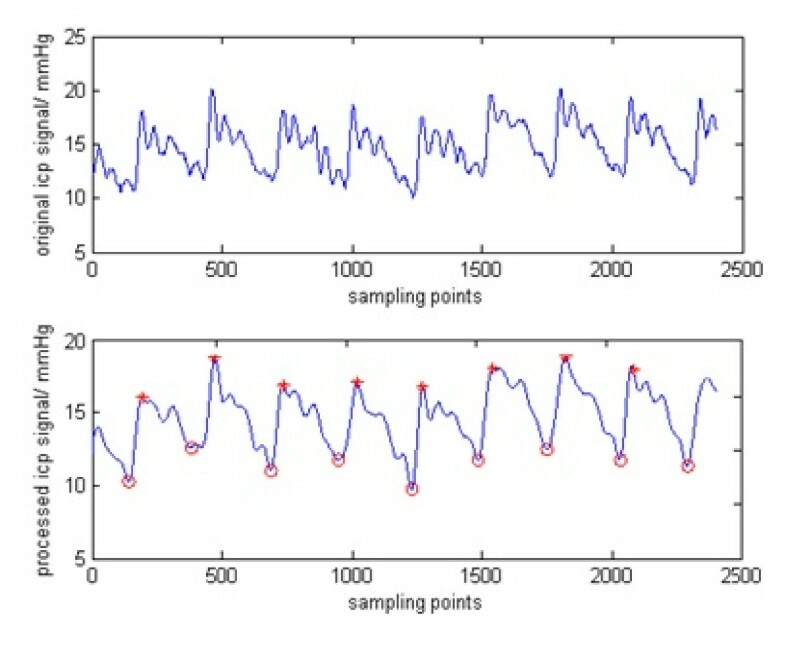 Since the continuous ICP signal is dynamic and often interfered by noise, the feature points used to identify the single ICP wave may be inconspicuous. 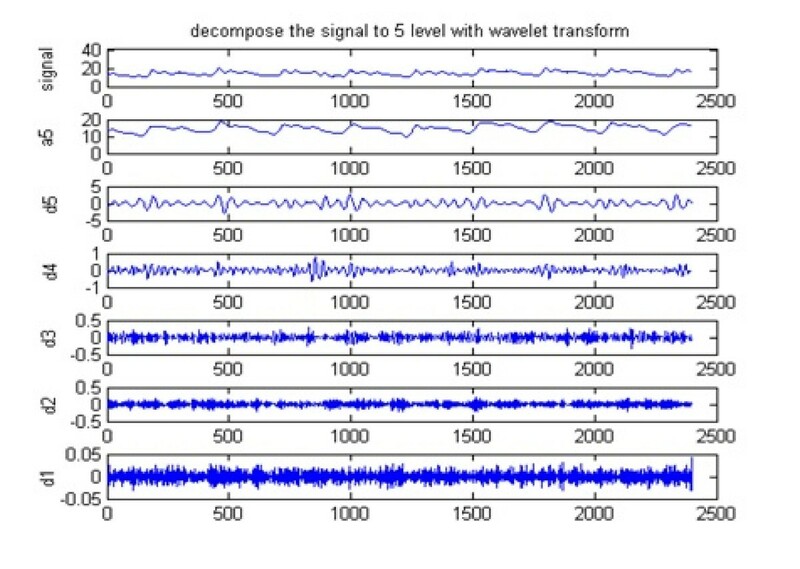 Wavelet transform is a signal processing method broadly used for signal de-noising and feature extraction [8, 9]. However, in practice, because of the variation of wavelet bases, it is often needed to try different wavelet bases to find a suitable one according to the wave features of analyzed signal. The research and discussion for the first generation of wavelet are conducted within the framework of Fourier analysis, i.e., the problem is analyzed in the view of frequency domain. Sweldens used a new wavelet construction algorithm that does not rely on Fourier transformation, but on lifting scheme to construct wavelet in time domain, then he established the second generation wavelet transform theory [10, 11]. Compared with the first generation wavelet, the lifting wavelet can be used to self-define wavelet construction based on the characteristics of the analyzed signal. It contributes to a better real-time performance of the diagnosis system by reducing calculation. Based on the lifting scheme, according to the characteristics of a single ICP wave, an appropriate wavelet can be constructed to remove noise effectively; furthermore, the discrimination rules can be developed for the extraction of single ICP waves. In this way, the extreme points of single ICP waves can be detected with higher accuracy. The wavelet decomposition based on lifting scheme could be divided into the following three stages: split, prediction, and update [10, 11]. split s i = s ′ i - 1 , d ′ i - 1 .
d i - 1 = d i - 1 ′ - P ( s i - 1 ′ ) . where the obtained subset si-1was smaller than the original signal set s i , and the wavelet subset di-1could also be obtained, i.e., the signal had been implemented wavelet transformation. Among the three stages, the prediction and the updating steps were the core of wavelet lifting. The high-frequency and suitable low-frequency information could be acquired, respectively, by predicting and updating steps. It is easy to understand that the above algorithm only needs the output of former updating step, so that the former data stream of each point could be replaced by the new one. Namely bit operation, which did not occupy the system memory, could be achieved. s ′ i - 1 d ′ i - 1 = merge ( s i ) . In the algorithm, P and U could be chosen to construct the wavelet and scaling functions with some characteristics. 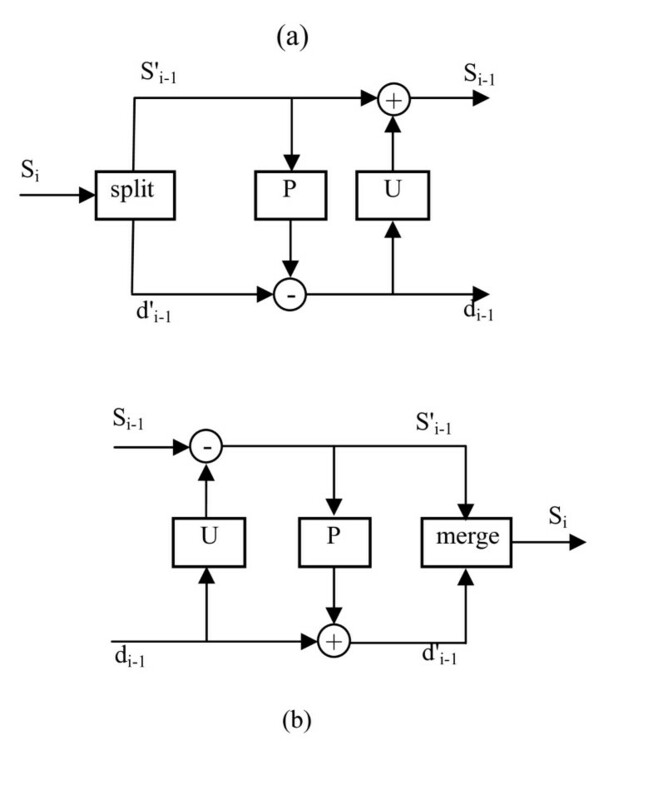 The split and merging process of a single lifting are shown in Figure 1. Splitting and merging process of once lifting. The definitions of parameters were introduced to describe the characteristics of a single ICP wave . In Figure 2, the starting minimum diastolic pressure of the single wave (P min1) defines its start, the ending minimum diastolic pressure (P min2) defines the end, and the maximum systolic pressure (P max1) defines the maximum of the single wave. 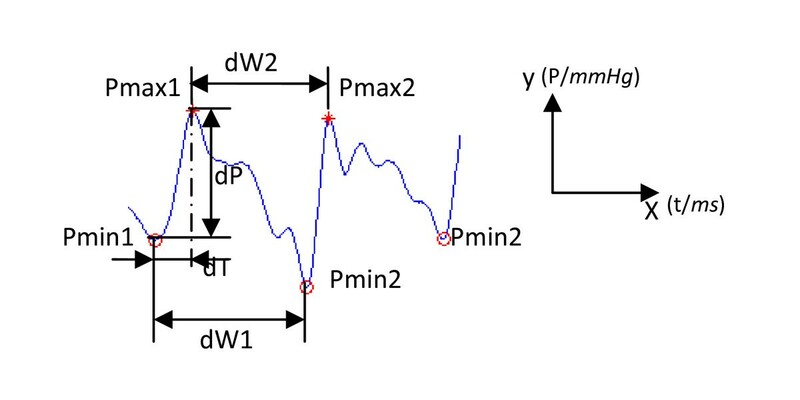 In this article, the time duration dW 2 of two maximum systolic pressures of adjacent ICP waves, a new parameter, was also introduced to discriminate whether the detected extreme points were correct. The single ICP wave amplitude dP was defined as the pressure difference between P min1 and P max1, the latency of a single ICP wave was the time interval when the pressure changed from P min1 to P max, the dW 1 defined the time duration of a single ICP wave between P min1 and P min2, and the dW 2 defined the time duration between the two peaks P max1 and P max2 of two adjacent ICP waves. Definitions of single ICP wave parameters. where .x was the time value of the feature point and .y was the pressure value. Calculate module mini-max values of ICP signal in every sliding window as the feature points of the single ICP waves. These computed positive and negative module maximums were regarded as the peaks and valleys. Lifting wavelet transformation was applied to the above four steps to get the mini-max points. However, if only lifting wavelet transformation was used to identify the single ICP wave, some extreme points might be undetected or detected falsely. Further analysis indicated that after the above four steps, several abnormal cases of extreme points existed, which were identified with frames in Table 1. These abnormal cases included: (a) two minimum points close to each other were identified between two maximum points; (b) two maximum points close to each other were identified between two minimum points; (c) no maximum point was identified between two minimum points; and (d) no minimum point was identified between two maximum points. Based on the above-mentioned definitions in Figure 2 and formulas (7) to (10), dW 1, dW 2, dT, and dP were calculated, and the ranges of the first three parameters were determined: 500 ms < dW 1 < 1200 ms, 500 ms < dW 2 < 1200 ms, 100 ms < dT < 250 ms; and single ICP wave amplitude (dP) should be between 3 and 20.0 mmHg. Further discrimination processing was made to find out the missing extreme points and filter the false ones, therefore the identification ability of ICP waveform was improved. When dW 2 was within the normal range, if no maximum point was identified between two minimum points and dW 1 was out of the normal range, then a minimum point was missing. After further analysis of the data between the two maximum points and estimation of the value of dT, the missing minimum point was found out. Step (5) and (6) should be repeated till no more undetected or falsely detected points could be identified. 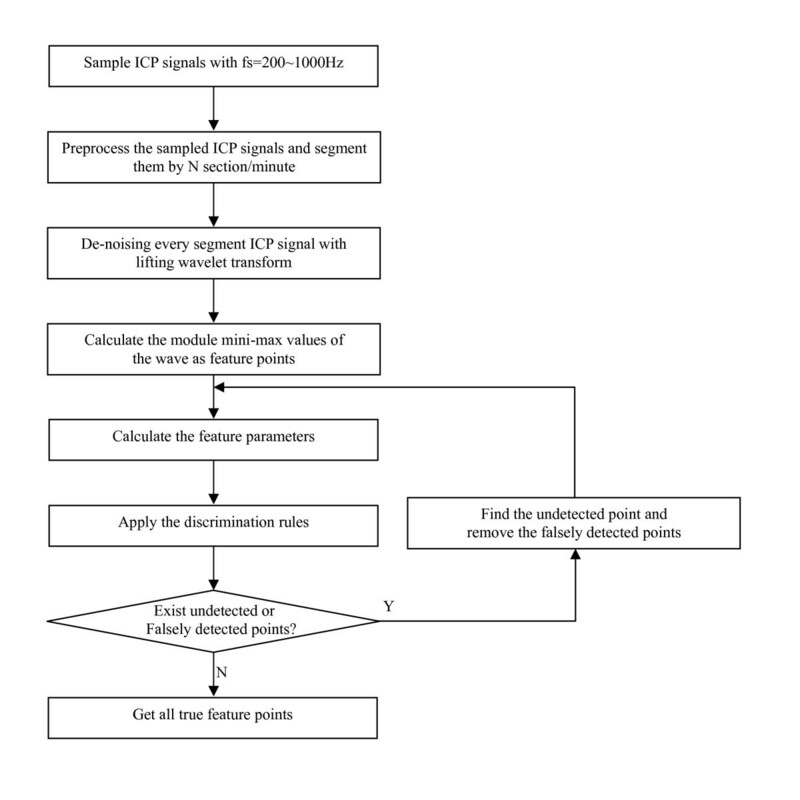 The flow chart of the algorithm is shown in Figure 3 and the discrimination rules in Figure 4. 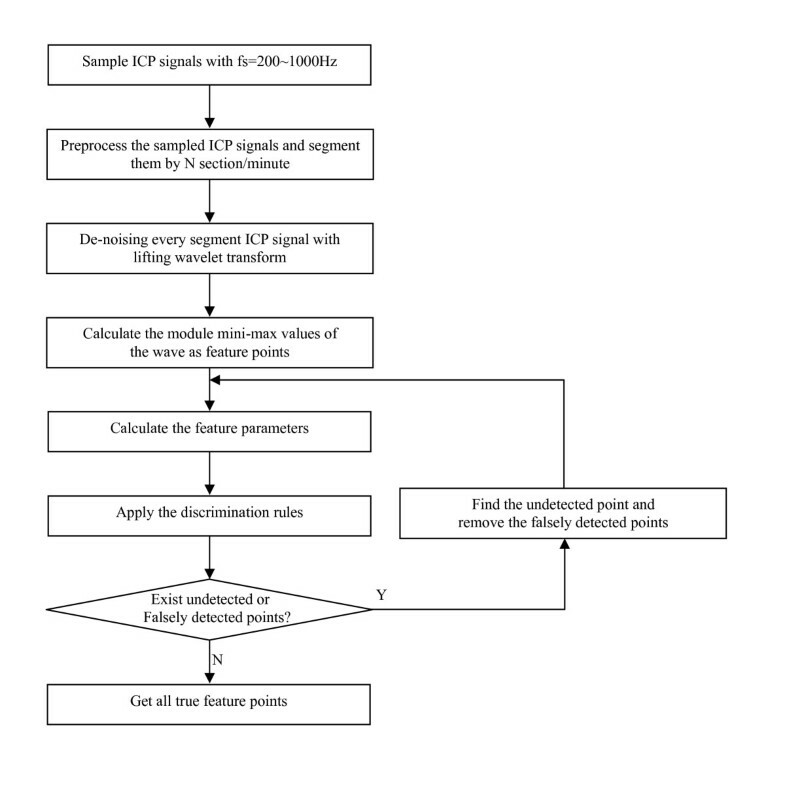 In the figure, L1low = L2low = 500 ms, L1high = L2high = 1200 ms.
Flow chart of our algorithm. Continuous ICP monitoring is usually applied to the patients with head injury, cerebral hemorrhage, cerebral tumor, etc. The continuous ICP signals in this study were monitored using Codman intraparenchymal micro-sensors (Codman and Schurtleff, Raynaud, MA) situated in the right frontal lobe. The ICP signals were recorded from nine patients, including three traumatic brain injury patients, three cerebral hemorrhage patients, two hydrocephalus patients, and one cerebral tumor patient. The sampling frequency is 400 Hz. At the same time, electrocardiograph(ECG) and arterial blood pressure(ABP) signals were also recorded. Figure 5 shows 6-s simultaneously recorded ECG and ICP signals of a patient. It demonstrates that the ICP wave is related to the cardiac beat and is disturbed by noise, which makes it technically challenging to extract the single ICP wave because its feature points cannot be located accurately. Wavelet transformation as an effective de-noising method was applied to the continuous ICP wave. Figure 6 illustrates the decomposition results with the first generation wavelet and Figure 7 with lifting wavelet. 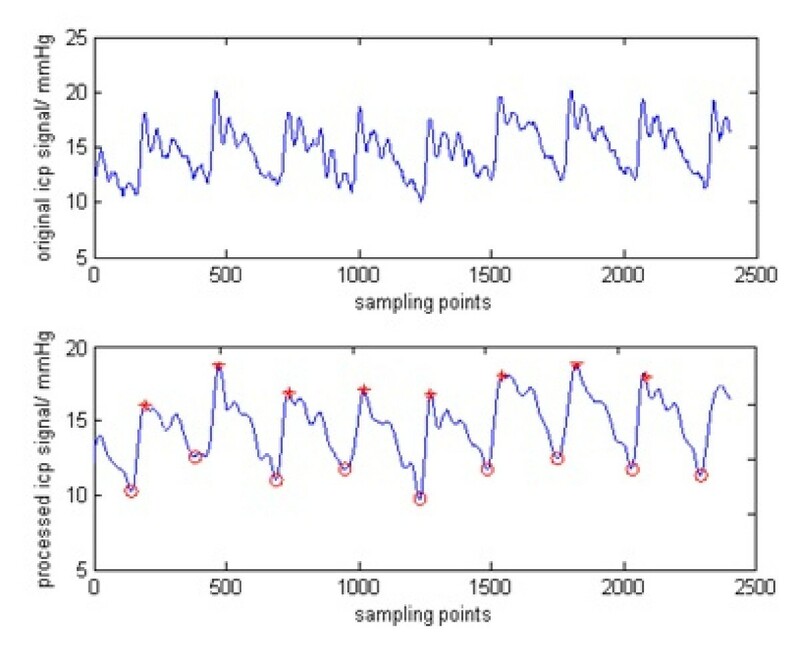 By comparing the two figures, it could be seen that more noises existed in the detail signals of the first generation wavelet transform, which would affect the subsequent computation of modulus maxima if noises were severe. Thereby, the feature points of a single ICP wave could not be located accurately. In that case, artificial estimation was needed to obtain better de-noised results. However, the problem did not exist in the detail signals of Figure 7, thus it was simpler to de-noise the results with lifting wavelet. 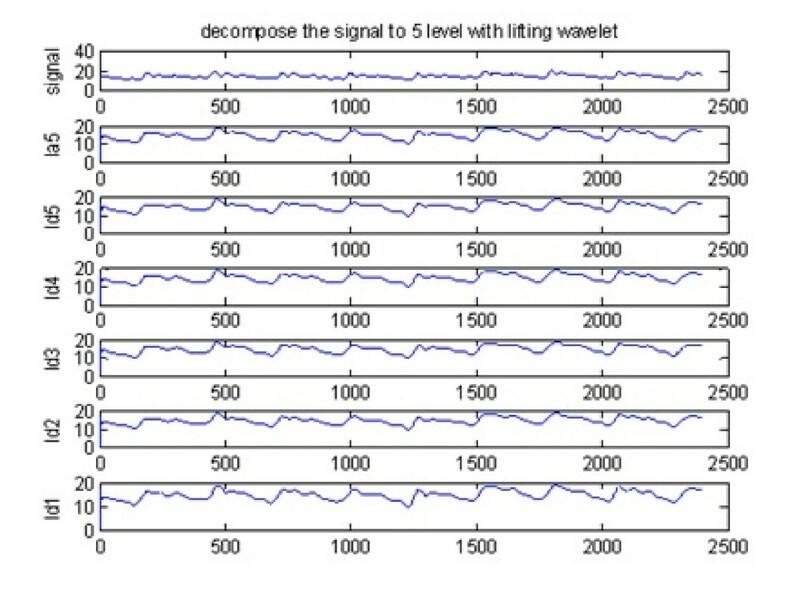 Continuous ICP signal decomposed with the first generation wavelet. Continuous ICP signal decomposed with lifting wavelet. The maximum and minimum values of a single ICP wave could be computed by employing modulus maximum algorithm to the de-noised continuous ICP wave . 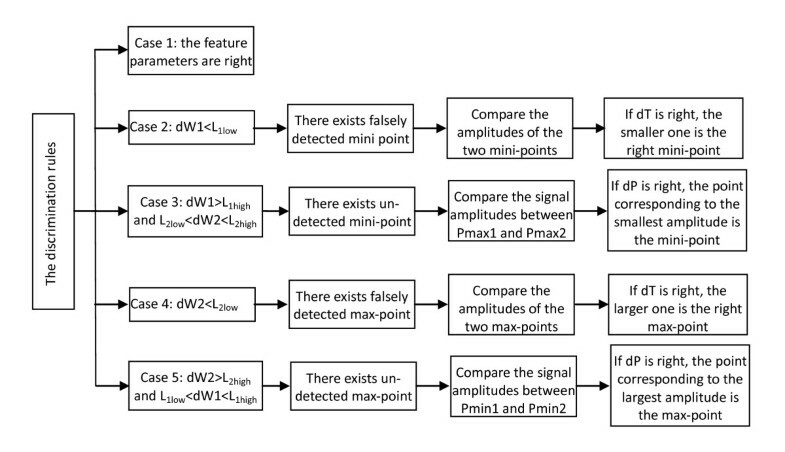 Figure 8 illustrates that every single ICP wave is located precisely and identified effectively. Identification of single ICP waves during 6-s time window. The parameters of every single ICP wave could be obtained by computing the eight ICP waves in 6-s time window shown in Figure 8, then the continuous ICP monitoring wave could be described with more parameters, which made the monitoring ICP data reflect the change of ICP more objectively and accurately. Furthermore, to testify the validity of the algorithm developed in this article, clinical continuous ICP signals with the length of 30 min of nine patients are chosen. Based on our algorithm, the analyzed ICP signals were divided into N segment/min first, here N = 2, so every ICP signal was divided into 60 segments with the length of 30 s. Applying our algorithm to every segment ICP signals, Figure 9 shows the identification of a segment before using discrimination rules, and Table 1 shows the detected extreme points. The time duration between two adjacent sampling points was 2.5 ms. As inferred from the table, the abnormal cases demonstrated in Section 4 occurred. By employing the algorithms, the false and missing extreme points could be detected, and further processing could remove the false extreme points and supplement the missing extreme points, as shown in Figures 9 and 10. In Figure 9, a green square represents that multi-maximum points exist between two minimum points; a megenta square represents that multi-minimum points exist between two maximum points; a black pentagram represents that a maximum point is missing nearby; a blue diamond represents that a minimum point is missing nearby. In Figure 10, a green square represents the reconfirmed maximum point in the false ones; a black square represents the missing maximum point; a megenata square represents the reconfirmed minimum point in the false ones; a blue diamond represents the missing minimum point. Use the discrimination rules repeatedly, till no more undetected and falsely detected extreme points can be discriminated. Detected extreme points with lifting wavelet and abnormal cases found out by discrimination rules. Detected and determined extreme points with our algorithm. For all the continuous ICP waves of nine patients, compared with the diagnosis results of clinical expertise, the analysis results with our algorithm are shown in Table 2. It can be seen that the accuracy rate was improved from 92.95 to 98.58% by using our algorithm with discrimination rules after lifting wavelet. Therefore, the method described in this article has given a possibility for the clinical use of ICP waveform. A new novel method was developed to identify single ICP wave based on lifting scheme and the discrimination rules. In this way, not only mean ICP but also single ICP wave amplitude and latency could be computed accurately; therefore, more information about ICP change could be provided in clinical practice. The present work is supported by Scientific Research Foundation for Returned Researchers of Ministry of Education (Foreign Secretary Education, No. 1341), the Key Sci & Tech Research Project of Chongqing (CSTC2009AB5200, CSTC2009AA5045, CSTC2010AA5049, CSTC2010AA5050) and Natural Science Foundation of Chongqing (CSTC2009BB5035). The author would like to thank Dr. Gurinder K Singh for critically reviewing the manuscript.